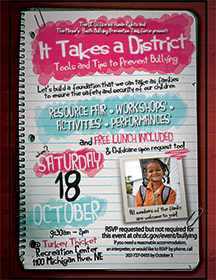 The D.C. Office of Human Rights and the Mayor's Youth Bullying Prevention Task Force are holding It Takes a District: Tools and Tips for Families to Prevent Bullying October 18 from 9:30 am - 2:00 pm at Turkey Thicket Recreation Center (1100 Michigan Ave NE). The event is FREE and lunch will be served. The day begins with a resource fair, at which families can learn about bullying prevention from government agencies, nonprofit organizations and schools. Professionals will be available to meet individually with families to create family bullying prevention plans.